Kara's Party Ideas | Kids Birthday Party Themes: giveaway! paperbox press! Kara's Party Ideas | Kids Birthday Party Themes: giveaway! paperbox press! I have a wonderful giveaway for you! Do you have a party coming up? 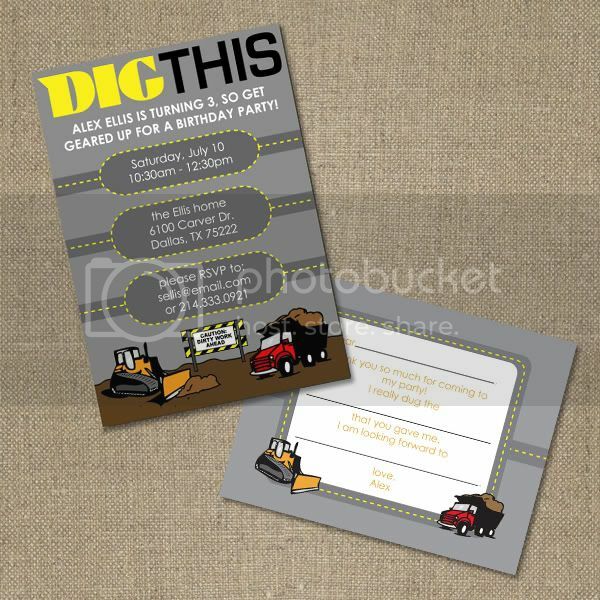 Do you need a custom invitation for something? $40 Gift Certificate to Paperbox Press! *Paperbox Press* combines a passion for pictures, parties, and paper! It is a boutique site offering high quality products at reasonable prices, with the promise of outstanding customer service. Paperbox Press offers custom double sided Birthday Invitations, Bridal/Baby Shower Invitations, Birth Announcements, Holiday Cards, Family Enclosure Cards and a variety of other personalized paper goods! So, whether you are celebrating a baby, a wedding, a birthday, or anything in between, Paperbox Press can help you mark the milestone with one of their fabulous cards. The digital age hasn’t made beautiful paper goods obsolete, it has made getting a card in the mail so much more special and personal. 1 - "Like" Paperbox Press on Facebook here and leave a comment saying you did so! 2 - Check out Paper Box Press & Leave a comment with either your favorite design OR a design you'd like to see! 3 - Sign up to receive special offers http://paperboxpress.com/newsletter-subscriptions and leave a comment saying you did so! The giveaway ends Monday, August 16 at 9:00 AM mst. The winner will be announced shortly after. GOOD LUCK! I love the Abigail Cupcake Birthday! I love the cupcakes and tea bridal shower invites! My fiance proposed using cupcakes so they would be perfect. I "liked" paperbox on FB. Also, I think the princess birthday invite is super cute! I think the "ornament" christmas cards are adorable! I signed up for their newsletter/email updates! I just found out minutes ago that my sister is having a baby girl (after 2 boys!) in January. This would be perfect for a babyshower. I am currently looking for invitations for our daughters 1st birthday. I absolutely love the sweet birthday invitations! I "liked" PaperBoxPress on FB. 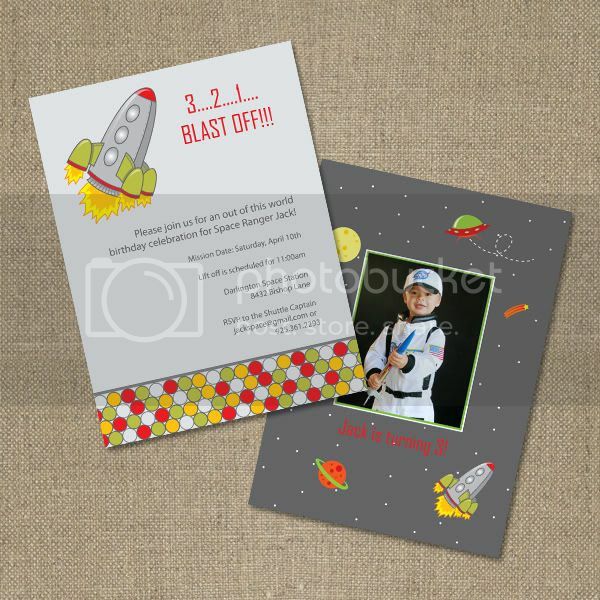 My son is a complete space fanatic and the space/rocket ship themed invitations would be fantastic for his 4th b-day! i liked and i love the bold shower flower print. I "liked" Paperbox Press on Facebook! Our daughter's 2nd birthday is a princess theme and that princess castle photo birthday invite would be perfect! I just took photos of my kids at the lake while we were in the States for our Christmas card- I saw the perfect one in the holiday cards section! What a great giveaway! I 'Liked' Paperbox Press on Facebook! If I were to choose a style from the site, I would pick the "sassy zebra' bridal shower invitations. My best friend is getting married and I'm the maid of honor! I am giving a baby shower in November as soon as we find out if it is a boy or girl I would choose but they are so cute and I cant decide! I did all 3 but for some reason the link you provided to the site isn't working. Don't know if it was just me but I tried it a few times. Anyhow, liked on FB, checked out site - Halloween cards would be cool, I send a "Happy Halloween" card to each of my past clients (yes, EVERY SINGLE ONE!) and I get them custom printed so it would be awesome to give them a try! I am a matron of honor in an upcoming wedding and would love to get the "cupcakes and tea" shower invites for the bride. So cute! I "liked" Paper Box Press on FB! I'd love a custom fish design fom my son's 2nd birthday coming up. What beautiful designs! I signed up to receive their newsletter. I love their birth announcements and my daughter is having a little girl, they would be perfect. I am doing a Teddy Bear Picnic theme for my daughter's 1st birthday and would love to see some sort of teddy bear invite! I love the dig this and the cowboy birthday invites, either would be so cute for my little man's bday coming up! I am already planning my daughter's 1st birthday party in January. I love the Sassy Zebra. It would be perfect, especially if a picture could be included. I went to their site; I love the holiday cards! Very cute!! I like paperbox press on FB! 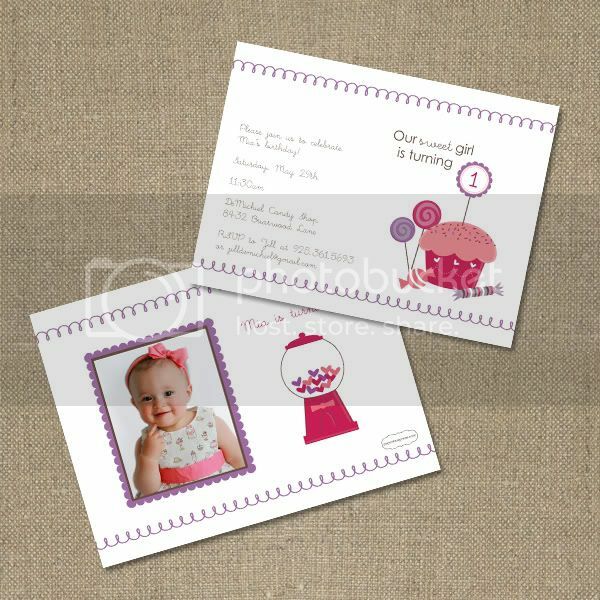 'Sweet Birthday' is just too adorable and would work perfectly for my niece's first birthday coming up in a few months. I love their website and have used them in the past! The monster bash birthday party invites are too cute!! I forgot to mention in my earlier comment (I think I was still half asleep!) the I "like" on facebook! A became a FAN of Paperbox Press on FB and signed up to recieve their newsletter. I went ot their website and just loved all the choices they offer. I really liked the sassy zebra which would work wonderful with the barbie party we are planning for our six yr old. Also loved the brown and pink one which would work well with our daughter's 1st birthday that we are also planning for in 3 months. Lots of choices so hard to choose. Thanks for the offer to try something new. Did all 3 :) Thank you for this referral. So cute. I "liked" paperboxpress on facebook, subscribed to receive special offers, and I like the "our sweet girl is turning 1" cupcake design. So cute for my nieces upcoming 1st birthday!!! i "liked" paperbox press on FB! so cute! I "liked" paperbox press on FB!! I visited paperbox press website and I'm loving the orange stripes and dots birth announcement since I'm expecting #2 in a few weeks!! I love the classic stripes and dots enclosure cards. Great for any gift-giving occasion! I liked the sassy zebra! I'm totally digging the "Abigail Cupcake Birthday"! I went to the site (and bookmarked it!) I LOVE the cupcake/sweets for the "sweet" girl as my own little cupcake is about to turn one and we're doing a cupcakey theme. But really, everything is GREAT. I'm also eyeing the spacey stuff for my son. I like the Carnival invite! So cute. I also signed up for the newsletter. Im not sure...I like everything, I could always have a party! Lots of birthdays coming up. i like it...i like it alot...as mr jim carey would say! I "like" Paperbox Press on Facebook! I love the Bubble Flowers Baby Shower. So cute! Would love to see a SHARK themed invitation! I signed up to receive special offers @ Paper Box Press on 8/9/10 @ 10:14pm. I love the designs! Love the Funky Snowflakes card. Also signed up for the newsletter! Such cute designs! I like the banner birthday the best! Every design was cute!!! Great company!!! I liked PBP on Facebook! I signed up for the PBP newsletter! I liked the Zoo Safari Animal Invite. My son is turning 2 at the end of Oct, and I am already hunting for ideas. Great giveaway. Addicted to your blog girl...thanks for sharing daily inspiration and for this AWESOME giveaway!!! I 'like them' on FB! My son is turning one in September & I am doing a frog theme party. I didn't see any frog invites so I would love to see a custom birthday invitation. I love the classic birthday announcement! I would like to see a vintage Halloween party invite! I am throwing a party this year and these would be perfect! I'm already thinking of the holidays and I love their "Champagne Bubbles" holiday card- simple and classy. I "liked" PB on FB :)I love the gumball machine invite. Adorable! I love the sassy zebra! I Liked paperboxpress on facebook. I signed up to receive special offers. I love the Carnival Birthday design. I love them all. I am planning my little girls 1st birthday and would love to get her to do a pink and orange invitation to match the party. She has some great designs. I liked them on FB. Thanks! I love the Carnival Ticket Birthday design, but the Cowboy Birthday design is very cute too! Can't wait to order my invitations for my daughter's first birthday! I liked PaperBoxPress on facebook! I subscribed to the PBP newsletter! 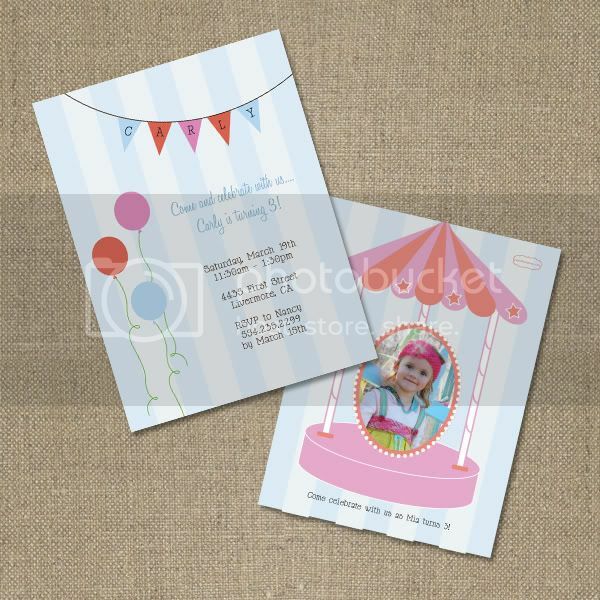 I like the retro tricycle birthday invitation and would like to see one with a wagon (radio flyer) or sock monkey! I "liked" paperboxpress on facebook. We are having a butterfly garden themed birhday party for my almost 3 year old and I love the "Danty Butterfly" invitation! I love the "Owl Birthday" card! 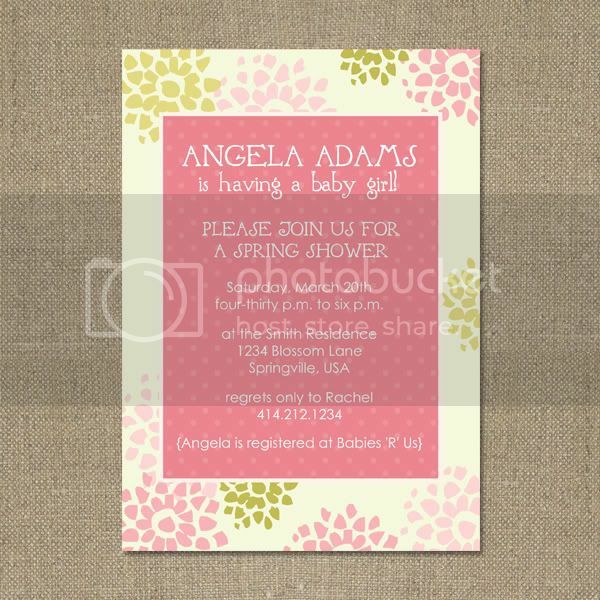 I love the bubble flowers baby shower invitations. I am planning a couples "diaper shower" and these would be so cute! My favorite is the Maia Birthday!! Everything is so cute. I now follow your blog AND like them on Facebook! So glad I found your blog ~ very cute!!! I LOVE the pinky dots baby girl birth annoucement. I wish I would've known about paperbox press when my daughter was born! I'm signed up for their newsletter now so I won't miss out next time I need invites or an annoucement for something! Great give-a-way by the way! Love your blog! I really liked the girl birth announcements and will hopefully order some in October. Perfect timing! I would love to find a magician/magic show birthday party invitation. I have scoured the internet for something cute/classy, and am having no luck at all! Let me know if you do something custom. This party is next month and I am completely out of options! Thanks. Did my thing on FB and subscribed for the newsletter. I'm trying to decide what to do my soon 5 yr. old son's b-day in November.. You can bet though it will be something off your website! LOL! I LOVE all the work!!!!! I like the Abigail cupcake birthday invitations for my daughters birhtday coming up! I signed up for the newsletter/updates email! love this site! I refer everyone here and get so many ideas! would love to win this giveaway! I liked Paperboxpress on Facebook, and signed up for their newsletter. My daughter's birthday is coming up in a couple of months and I'd love to have invitations from them for it! 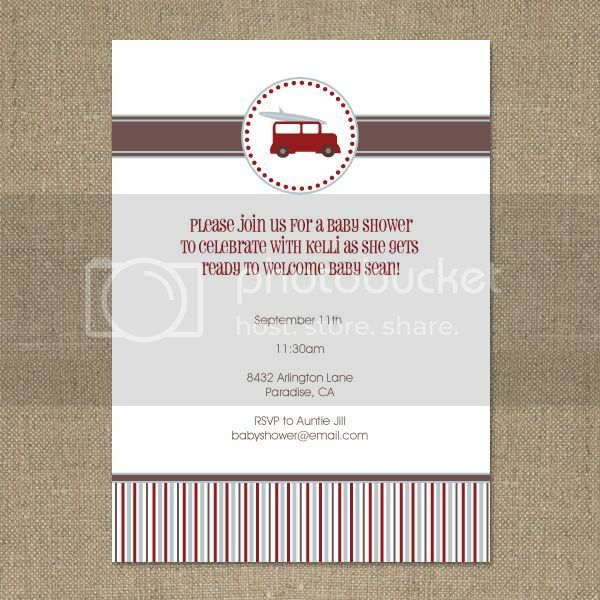 I like the banner invitation because it's simple and sweet, and could go with many themes. 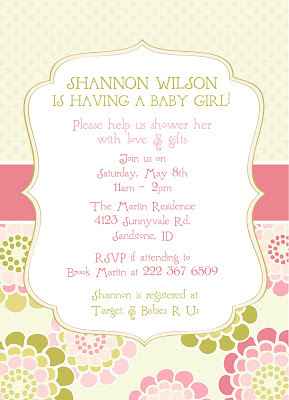 I love the retro dot baby shower invitation!